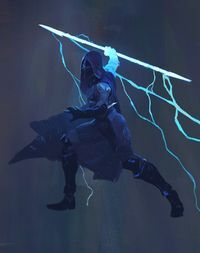 Artwork of an Arcstrider Hunter using the Arc Staff. Arc Staff is a super available to Hunters that have chosen the Arcstrider subclass. The Arcstrider summons a fighting-staff infused with Arc energy, which they use to hit enemies with. When Arc Staff becomes active, Arcstrider Hunters gain a polearm infused with Arc energy that can be used to slice enemies while rapidly progressing around the battlefield. If in the air, the Hunter can slam the staff down, causing area-of-effect (AOE) damage. There are also many combos that can be used, by pressing different buttons or keys in rapid succession. It also grants the user increased movement. The Arcstrider subclass and Arc Staff super were created after Guardians harvested Light from the Traveler's shard in the European Dead Zone. After the Guardian reclaimed his light at the shard, the Arc Staff was used to defeat numerous Fallen, including Skriviks, the Sharp-Eyed. The Super features the first physical staff that Guardians can wield in battle. The ability is reminiscent of martial arts combatants. An Arcstrider uses the Arc Staff to battle Brann, the Unbent Blade.